Choosing the right lumber (wood) for your woodworking or construction project is not as hard as it seems. Here’s the information you need to get started and well on your way to completing your next do-it-yourself project. The wood used for furniture and other fine projects differs in many ways. If you have been wondering how to pick and choose the right piece then you are in luck. Here is everything you need to know to pick the right lumber for your next DIY project. Sketch out your plan or project to make a cut list of all the lengths you will need. Use this cut list to determine how many and what sizes of boards you will need. If you are following an online plan then you will most likely have your shopping list of wood available for you. I would suggest going to a local lumberyard if you have one nearby otherwise a big box store will work too. Local lumberyards usually have better quality wood and more expertise if you have questions. Hardwoods are your best lumber when it comes to woodworking (esp. building furniture) but they will also cost you more. Depending on your project pine will work just fine. It is a cheaper softwood. Depending on your project also makes a difference in the grade of wood you buy. It might be labeled differently at each store but you will be able to tell by pricing alone. The more expensive the lumber the better the grade. The select grade will be great for projects you plan to stain. These boards are usually clear of all knots and discolorations. Regular or common grade might have several knots but will work just fine if you plan to paint your project. It is important, esp. if you are new to woodworking and designing your own plans to remember lumber is not true to size. A 1×2 is usually 3/4″ x 1 1/2″ …etc. You might be very upset when you plan out your project and your measurements are off because you forgot to take this into account. When purchasing your lumber pieces always inspect each piece. You don’t want any cracks or splits. You also want to check for warping or bowing. Minor bows or warps can be fixed when nailed but otherwise pass the other pieces up. Don’t call and order your wood to be ready for pick up, esp. if you are buying at a big box. The selection you get is what they just randomly pick up and I can bet they won’t check for splits, cracks, warps or bowing. To ensure your pieces all meet your standards go pick them out yourself. When you have all your plans ready and know what you want it doesn’t take too long to gather all your materials. Lumber prices vary by season, demand, etc. What you bought last year or even perhaps last month might not be the same as today. When you finally do get to your project building day always remember measure twice (sometimes more) cut once. Slow and steady wins the race, don’t rush through cutting your pieces otherwise you are sure to miss measure or make a mistake. Don’t try to do everything all at once. Set a small goal to complete and then take a break and come back refreshed. 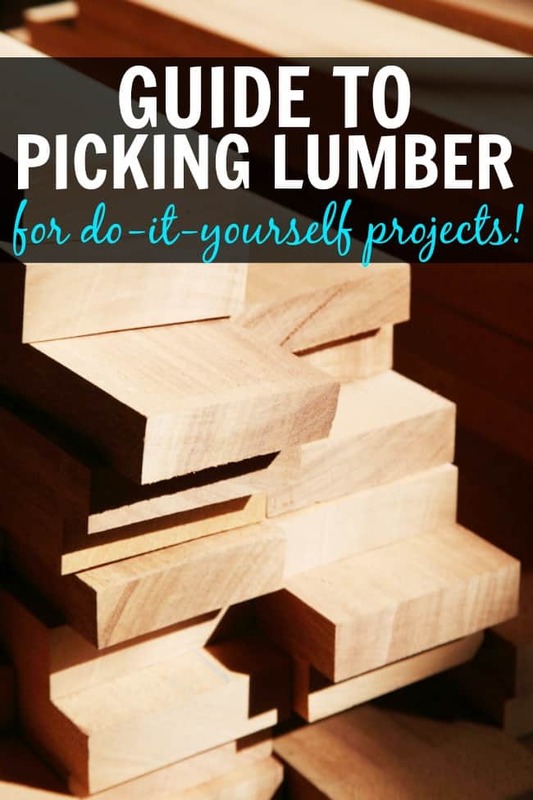 If you found these Guide to buying lumber tips helpful you might use them to build one of these fun DIY projects. Great tips! I’ve had too many experiences taking damaged wood back to the store. I know right, that could really mess up someone’s day. Great tips! I’m a little new to working with wood so these were very helpful. Thanks for sharing!